Close objects are out of focus. Unlike the nearsighted eye, farsightedness can be partially compensated for by the natural lens of the eye, but only up to a certain age. 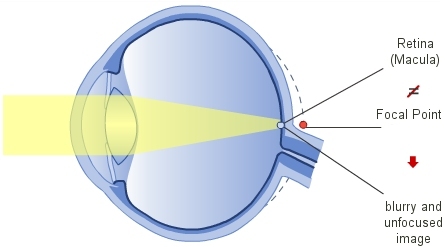 The lens has the ability to change its shape to give the eye increased refractive power, thus balancing the farsighted eye's reduced refractive power for distance vision. Distance vision of farsighted people generally remains good into old age. Eyeglasses need to be worn at a younger age only for those people with a very high level of farsightedness. Since the ability of the eye lens to change shape is reduced with increased age, the farsighted person will need reading glasses sooner than the person with normal vision. At a later stage in life, correction for distance vision will be necessary as well because the ability of the lens to change shape decreases to a point that sharp images for distance vision are no longer produced. Femto-LASIK (individual LASIK) up to +4 dpt. Phakic lenses (phakic IOLs) +1 bis +12 dpt. Lens operation followed by eye laser procedure To correct high and extremely high farsightedness, also to correct astigmatism or a residual refractive error.